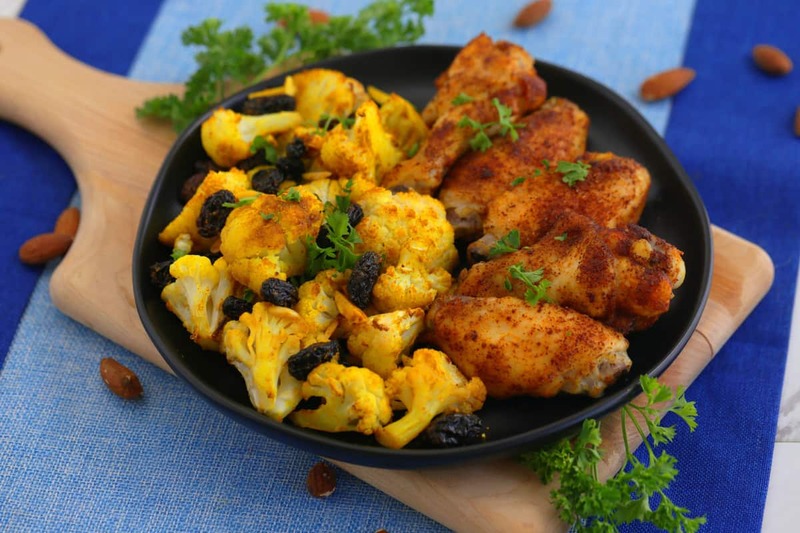 Whole30 Sheet Pan Dinner: Masala Style Crispy Baked Chicken Wings & Curried Cauliflower! Crave-ably crispy on the outside, baked-not-fried, and sumptuously spiced—these crispy baked chicken wings are truly irresistible! And, they’re unbelievably easy to prepare with only 3 ingredients: chicken wings, garam masala, and salt! 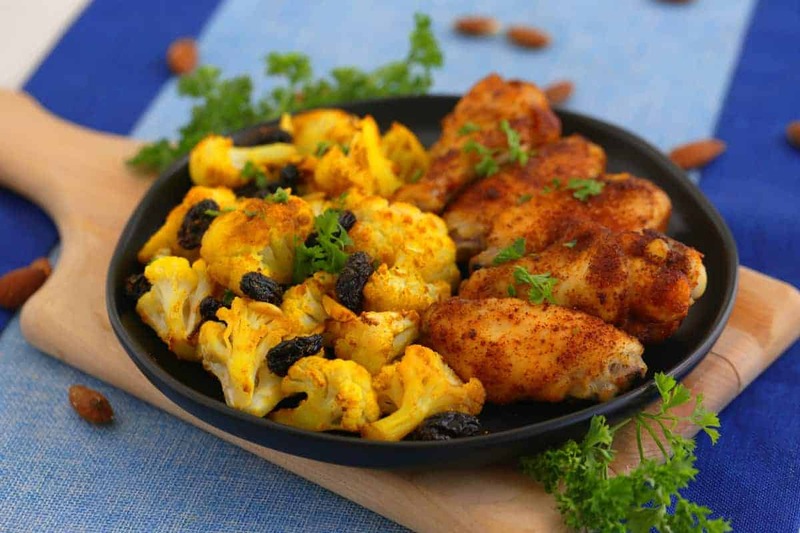 Served with a side of curry roasted cauliflower, you’ve got an Indian-inspired meal that’s wholesome, flavorful, and totally Whole30 compliant. I love the balance of spice, subtly sweetness, earthy flavors in this Whole30 dinner. Plus, there’s plenty of fun texture variation between the crispy wings, chewy raisins, and crunchy almonds. Best of all, you can prep your ingredients ahead of time, then toss everything onto ONE pan to roast all at once! In my healthy eating routine—especially when I’m planning a Whole30 meal prep—sheet pan meals are a lifesaver. The ingredients are ready to go so I can have a warm, healthy meal ready in under an hour. So much winning! The Whole30 is a challenge, no doubt about it. But, there are SO many ways to make it easier—with many of the same meal prep strategies that make any healthy eating regimen more manageable! For me, it’s sheet pan meals to the rescue. If you haven’t yet given ’em a whirl, these crispy baked chicken wings are a great place to start. Curious to learn more about Whole30? In my What is Whole30? blog, I explain the basics of the program and share tons of other Whole30 meals & recipes! As with any healthy lifestyle, meal prepping can make the Whole30 much more manageable. So, to prepare this sheet pan meal as part of a Whole30 meal prep, simply package and store the various components separately. That way, at dinnertime, everything is ready to get tossed onto the pan and into the oven! For the crispy baked chicken wings, you can either keep your wings in their original packaging or store them in an airtight container in the fridge. You could also separate the wings into individual portions, if you prefer. Personally, even though the seasoning blend is so simple, I also like to combine and store my garam masala and salt together so it’s ready to go! Then, simply chop your cauliflower florets to the desired size and store in airtight containers in the fridge. You can also portion out your raisins and slivered almonds, then combine or store separately in the pantry. When you’re ready to eat, everything goes on the same pan with your wings, toss with oil and seasonings, and roast! 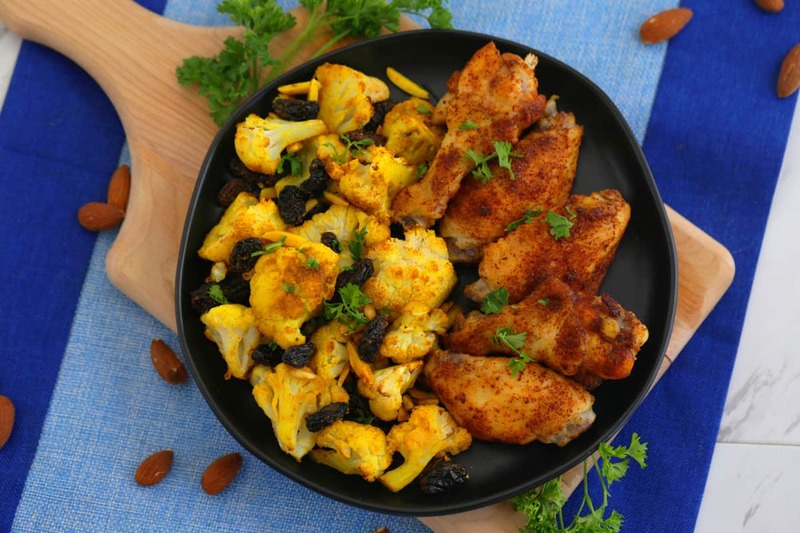 I usually add frozen pearl onions to roast with my curried cauliflower, raisins, and almonds, but I forgot at the time of filming and photographing this recipe! 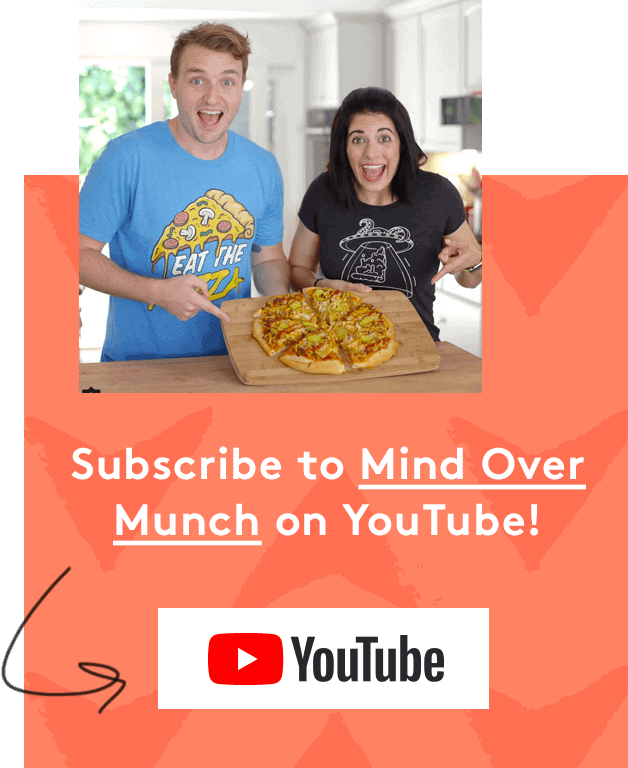 If you’re a fan, I highly recommend adding them. Pat your wings dry with clean paper towels before seasoning and baking. That way, you’ve removed the excess moisture so they’ll crisp up faster in the oven—before they overcook! Use a dry seasoning blend, rather than wet marinade or sauces. Again, if they’re drier going into the oven, you’ll end up with more perfectly crispy baked chicken wings! BONUS TIP: Try cooking your wings on a wire baking rack, if you have one. A wire rack allows heat to circulate above AND below your wings so they get crispier. Luckily, it’s easy to follow these tips and keep your wings Whole30 compliant. For my Indian-spiced crispy baked chicken wings, you don’t even need any oil! Simply rub your wings with garam masala and salt, place on a lined sheet pan, and bake. When I made these, I didn’t even use a wire rack and they turned out deliciously crispy! Preheat oven to 425°F (220°C). Grease a pan or line with foil and spray. In a bowl, whisk salt and garam masala together. Pat chicken wings dry with clean paper towels—this will help them crisp up! Coat each in the spice mixture and place onto baking pan. On the same baking sheet, add cauliflower, raisins and slivered almonds (and pearl onions, if desired). Drizzle with oil and add seasonings, except lemon zest. Toss well to coat. Finish cauliflower with lemon zest, portion into meal prep containers, and store for the week! Store chicken wings as desired—in their original packaging, in storage containers, or divided into individual portions for the week. Combine garam masala and salt in an airtight container and store until ready to cook. Cut cauliflower florets to desired size and store in airtight containers in the fridge. Portion out raisins and almonds and store. Measure seasonings for curry blend (except for lemon zest), combine in an airtight container, and store. Hungry for More Whole30 Meal Prep Recipes Like This? Check out my Slow Cooker Pineapple Turkey Freezer Meal from this Whole30 Meal Prep video, as well as my first Whole30 Meal Prep Recipes video if you haven’t seen it yet! 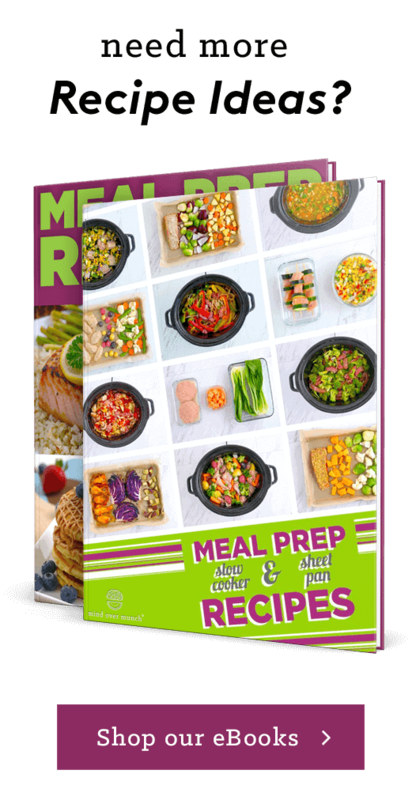 And, you might also like my Meal Prep Slow Cooker & Sheet Pan Recipes eBook! Endless easy weeknight dinner inspiration—with 20 sheet pan meals and 20 freezer to slow cooker meals, all designed for meal prep.